Santa Barbara is one of California's beautiful towns and would be considered one of our seaside gems. Prevail Conditioning and Performance Center was the location of Postural Respiration this past weekend. Owner and operator, Peter Blumert, provided a superior training facility for this weekend which followed his hosting Myokinematic Restoration last November. This weekend was a first for PRI! We introduced our latest revision of Postural Respiration. This course is packed with new material including a new test for posterior mediastinum inhibition called the posterior mediastinum reach test. There have been new documents added to support PRI concepts with loads of references for this course. In addition, case studies have been added and were a big hit with our students! 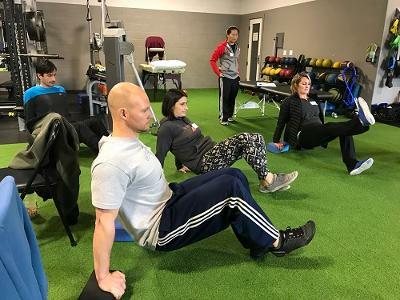 This was a course loaded with professionals in not only physical therapy, athletic training and sports performance but included an osteopath as well. Postural Respiration really describes how the diaphragm affects every system in the body. This course connects pelvis position to the ribcage and illustrates that breathing can be viewed as the gait cycle allowing ribcages to actually walk! That seems like such a far-fetched concept to those new to PRI on day one of the course and seems like such a bold statement. By the end of the weekend, every student could see that breathing is walking and the diaphragm and ribcage position and posture is key to tri-planer, dynamic, balanced gait. We also had a chance to introduce the effects of the diaphragm and the ribcage to the cervical spine and jaw as well. The connection with Postural Respiration and the neck and jaw was experienced by a student when testing HGIR, or internal rotation of a Humerus in a glenoid fossa. She experienced jaw pain during HGIR testing and learned there was a connection of the Omohyoid with shoulder blade, neck and jaw. This was reinforced when the manual technique to release her subclavius muscle was demonstrated. Not only did this technique make her tests neutral but her jaw pain was gone. She also understood that with any manual technique, a non-manual technique and progression via treatment guidelines will be needed. Needless to say she was enthusiastic about continuing her PRI journey! Thank you to Aimee Miyazawa, ATC, PRT for being a seasoned veteran of PRI and a wonderful lab assistant. Thanks again to Peter Blumert for hosting this course as he welcomes Pelvis Restoration later this year.